◆ 100V/120V/220V/230V compatible design to meet the needs of different power grids. The highest resolution of 1mV/1mA (SPD3303X), provides excellent setting and read back accuracy. 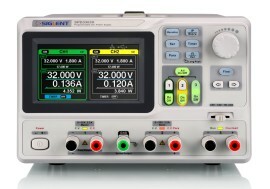 This ensures accurate output even with very with small changes in voltage or current. This is impossible with a low resolution power supply. Series and parallel functions allows for combining two channels into one output with more power output capability, extending the application range. Each of 3 channels power can be turned on or off independently and also can be turned all on or all off. Through front panel operation, five groups of timing settings and output control can be displayed, which provides users with simple power programming functionality. Also, by connection to Siglent’s EasyPower PC software, a full range of communication and control features can be used. The SPD3000X series programmable power supply can save or recall 5 groups of setting parameters in internal storage and also supports external storage expansion. Settings can be easily recalled if needed.